The thriced delayed launch of an ULA Atlas V booster from Cape Canaveral has been rescheduled for no earlier than Saturday, Oct. 14, at 3:31 a.m. EDT (0731 GMT). Orbital ATK has delayed the planned Oct. 17 launch of a Minotaur-C booster originally from Vandenberg to perform some additional testing on the rocket. The company has not announced a new date yet. Below is the launch schedule for the rest of the month. Space X’s countdowns are getting really smooth lately. Most of their delays are coming a few days before launch. 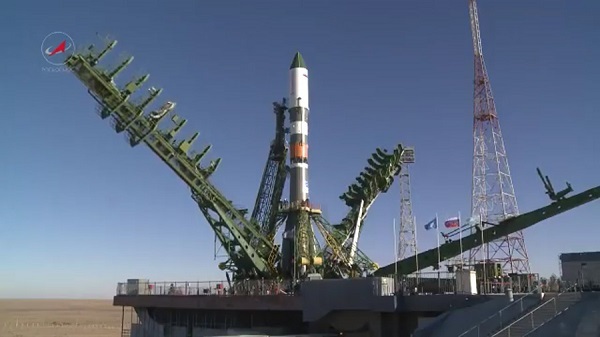 Spaceflight Now reported that the Soyuz launch was aborted (after) launch…..?? ?….That must have been a miraculously gentle descent back onto the launch pad, like a feather. ROTFLMAO. R-7 family rockets don’t stand on the launch pad – they hang by the waist from those four arms you can see in the bottom of the photo. Main reason for it is, back in the ’50s, they couldn’t guarantee all 20 thrust chambers ramping up at the same rate, which threatened to tip the missile over before it got going. This way, the rocket’s own weight is locking the arms in place until the engines achieve sufficient thrust – when the rocket starts rising, the arms unlock, and the counterweights on their opposite ends swing them away. If you start the engines, but shut them down before there is sufficient thrust for this to happen, the rocket won’t go anywhere. I believe SES-11 and EchoStar 105 are different names for the same satellite. Each company is just going to own half the transponders. Thanks for the info, Barmaglot, I didn’t know that. It sounds like a very clever system that would suit multi-engine rockets, like Falcon Heavy and BFR. Regards, Paul. There is no need for it anymore, modern electronic control systems obviate it – remember that R-7 was designed in the fifties, and the entire launch mount rotates in order to set the launch azimuth – all of them up to Soyuz-2 are incapable of rolling and thus need to be aimed at launch for the side-mounted antenna to link up with ground control.